This starling with the superb first name looks as if its black head is sticking out of a blue hood. But the blue is not really there. When light strikes microscopic specks in the feathers, red light is absorbed while blue light is reflected, giving the impression that the iridescent feathers are blue! 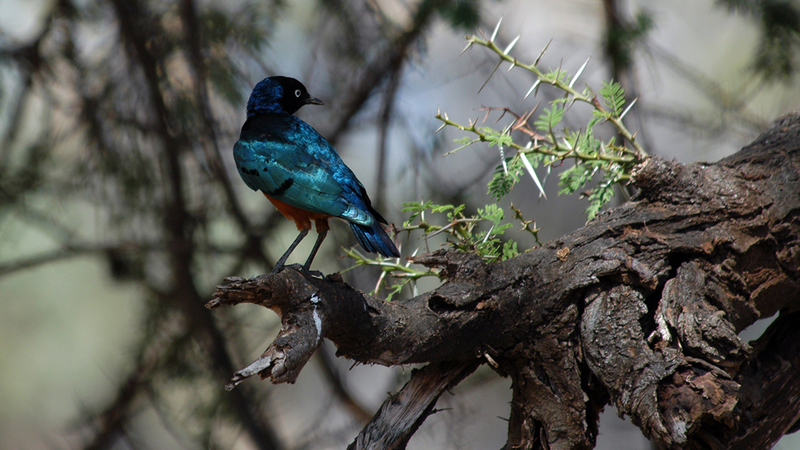 What is the Kenyan saying about the superb starling, which has feathers that shine with blues, blacks, and reds? You are favored by the gods if a superb starling poops on your shoulder. Bad luck is around the corner if a superb starling crosses your path. 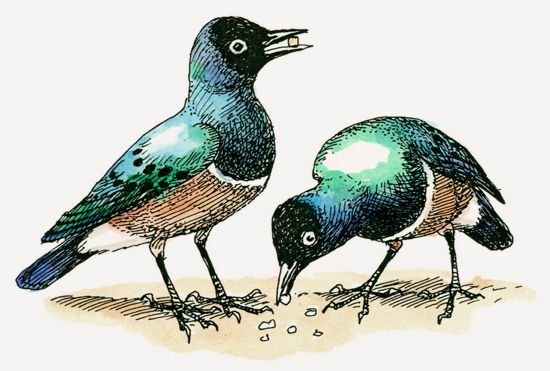 The only way to avoid a superb starling is to walk around with your eyes closed. 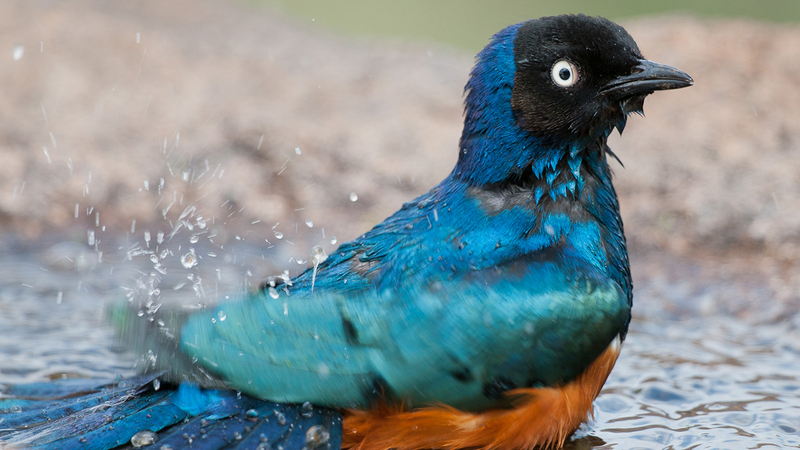 The only way to avoid a superb starling is to walk around with your eyes closed. 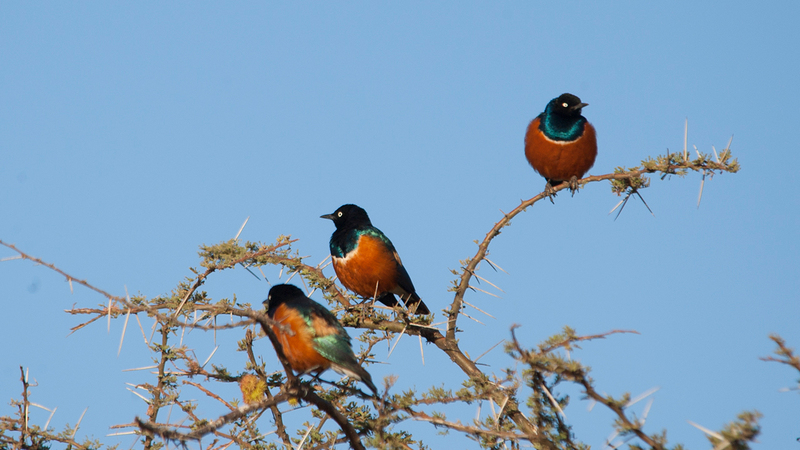 Superb starlings are found throughout Kenya. Their beautiful coloring and gregarious personalities make them hard to miss. As many as six pairs of superb starlings nest near each other. Juveniles help feed the chicks. 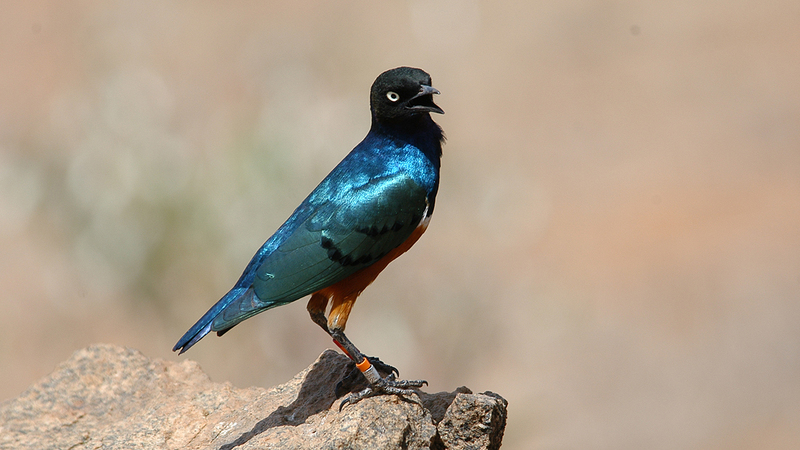 The superb starling’s song is long, rising and falling with skirls and squeals. In flight, its call is skrrrrrri. Superb starlings are gregarious and usually spend the hottest hours of the day in the shade, preening and singing. Superb starlings are omnivores that hunt on the ground for seeds and fruit as well as insects and other invertebrates, including crop pests. They sometimes become pests themselves by feeding on farmers’ grains. Pairs begin the breeding season by performing jumping displays, with wings outstretched and heads bowed. They build a nest of grass, leaves, and twigs, usually in a thorn bush, but sometimes in a cliff-side hole. Both parents incubate the two to five eggs for 13 to15 days. Chicks fledge in about three weeks. Superb starlings are often seen with similarly colored Hidebrandt’s starlings. Superb starlings are common throughout Kenya, excerpt for populated areas in western Kenya and along the coast south of Malindi. They favor open woodlands, farms, gardens, and urban areas. 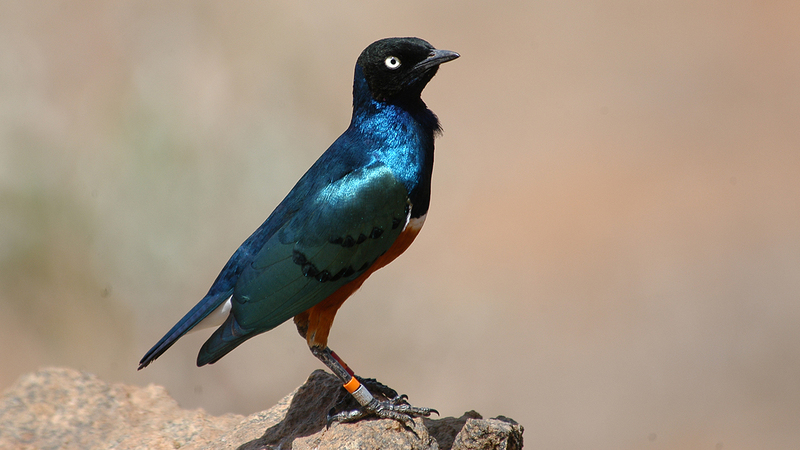 The superb starling is found in northeast Africa from southern Sudan through Ethiopia to Somalia and south to Uganda, Kenya, and Tanzania. It lives in woodland and thorn bush, around farms, and in urban parks. Superb starlings are so common in Kenya that people there say the only way to avoid seeing one is to walk around with your eyes closed.